We're continuing a Holiday Tradition on Never Fully Dressed by sharing some classic holiday films. Some might be institutions in your home this time of year; others might be delightful new friends, but they're all sure to impart some the season's spirit and sense of fun. Consider it my way of wishing you and yours nothing but the very merriest. "It's just a quiet little story, not a big picture. It has some charm,” the director told reporters when the film opened. 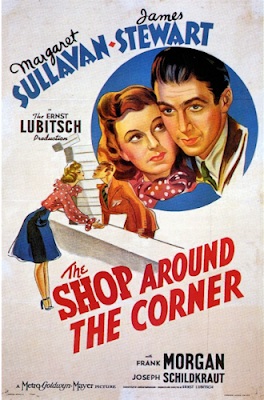 The Shop Around the Corner is indeed a quiet, little story and very charming for it- a far cry from the glamorous and uproarious films director Ernst Lubitsch was generally known for. Likewise, the love story perhaps has a ring of truth to it because stars Margret Sullivan and Jimmy Stewart were the two main players in one of Hollywood's most famous real-life, platonic love stories. Close friends, Sullivan gave Stewart's career the jumpstart it needed by requesting him to be her co-star. They would seem an odd mix, with him towering over her and both being so soft-spoken (Margret Sullivan was famous for her husky delivery). But somehow, it worked. Shop Around the Corner was then the third of four films the two did together, and the only one with a happy ending. In real life their ending was just as bittersweet- because it never got off the ground. Years later Stewart's wife, whom many felt bore a strong resemblance to Sullivan, would comment that both stars did love one another, but that Sullivan had been more interested in her career. Whether it was love or mere friendship, that quality is present on the screen. Matuschek and Co. is a small leather-goods shop that is just around the corner of a main thoroughfare in Budapest. It's days are enlivened by the store personnel who all work under their exacting employer Matuschek, played Frank Morgan, better known as the Wizard in a certain MGM film. The store's most senior employee, Alfred Karlik (played by Jimmy Stewart), has been exchanging anonymous letters with a young woman and is, he believes, well on his way to being in love. Most days he is long suffering as he attempts to soothe the increasingly short nerves of Matuschek. Meanwhile, a young woman named Klara (Margret Sullivan) manages to secure herself a a position at the store after selling an unsellable piece of merchandize. The two sale clerks are constantly at one another's throats, but are in fact each other's romantic pen-pals! This is Jimmy Stewart's story, with the action and emotional gravitas clearly centered on his clerk Karlik, but star-crossed lovers is not all the film has up its sleeve. Trouble is brewing in a different part of the shop too. If this story line seems a touch familiar to you- well, that's because it should. The Shop Around the Corner was based on a play, Parfumarie, and was later remade twice, as the Judy Garland vehicle In the Good Old Summer Time and the more recent, email-centric You've Got Mail. With the story being retold so many times, one might fear the original film would be dated or less smooth than those that came after. But that is simply not true. The film feels fresh even decades after it's release, with moments of genuine humor and genuine pathos. You will find yourself wanting to perusing the shelves, talk to the clerks, and buy into the charm of The Shop Around the Corner. I saw this a few months ago and thought it was so cute (especially since You've Got Mail is one of my favorite movies!). I just love any movie Jimmy is in, but I always get a kick out of movie endings from the 1930's. It's like the characters hate each other, don't get along, there's no way they'll ever end up together, and then- in the last minute of the movie- BOOM- a proposal and a passionate kiss! Haha it gets me every time. I thought the ending in regards to her feelings did end pretty quickly. You've Got Mail pays a lot more attention to both giving the characters legit reasons for not getting along and at giving both leads emotional growth through out. But then, they had the advantage of hindsight in seeing what the original lacked. Have you ever listened to the director's commentary on You've Got Mail? SO interesting! Ugh… I love this movie!!! So glad you reviewed it and now I want to watch In the Good Ole Summertime! I've actually never heard of this film before, but it sounds so wonderful! I always love your detailed movie reviews!